Mars, Earth and Venus are immersed in a flow of plasma, an ionised and highly variable gas originating from the Sun, called the solar wind. While Earth has a planetary magnetic field, which can deviate the flow of solar wind, Venus (and Mars) don’t. Gases in the upper atmospheres of these planets are ionised, and can thus interact with the solar wind. Venus is as large as Earth and it is difficult for its atmosphere to escape due to the planet’s gravity. The solar wind is the best source of energy to accelerate the upper atmosphere’s charged particles, giving them enough energy to escape. 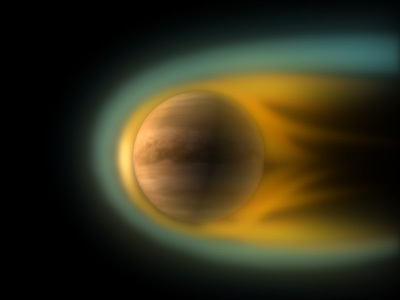 This is why Venus loses its atmosphere due to interaction with the solar wind. To understand this phenomenon, the key questions that the instruments studying plasma on Venus Express must answer are: what and how much of the atmosphere is lost, and where is it lost? Right now, solar activity is at its minimum in the 11-year cycle, making the solar wind weaker than average. The critical question now is how solar wind interacts with Venus when solar activity is low. They are getting warmer in regards to finding the actual answers, I think! *** Edit: Yeah, I know it's not a photo... but it's neat to think our ancestors were witness to something like that with their eyes! This brings up a question I have wondered about for some time. Since Venus is not protected from the solar wind by a magnetic field, as is the Earth, is the solar wind eroding away Venus's atmosphere? Could anyone furnish some links or otherwise on this subject? The solar wind is the best source of energy to accelerate the upper atmosphere’s charged particles, giving them enough energy to escape. This is why Venus loses its atmosphere due to interaction with the solar wind. Which makes me wonder- how can Venus have such a robust atmosphere, if the solar wind is ionically excavating so many particles (as they suggest it does) out of the Venusian atmosphere, then how is it that Venus keeps most of it's atmosphere, if the solar wind is so blustery? I know that there is a very long plasma tail behind Venus (not as energetic as it was a few thousand years ago) but you wouldn't think there would be much left of Venus' atmosphere after a few thousand years, if the solar wind was whipping it away. I had surmised that H2O production on Earth was actually engendered by the Sun- ionized hydrogen getting in through the Earth's plasmasphere, combining with free oxygen atoms, and forming water molecules that were being deposited at least at the north pole, if not both poles. Could it be that this very same hydrogen is being deposited on Venus, and the only thing being removed from the planet were some negatively charged ions it has in abundance, much as what occurs (to a seemingly much smaller degree) here on Earth? In other words- is it possible that the Sun is depositing more than it is withdrawing from the Venusian atmosphere? In regards to all this surmising of mine, please remember- be gentle! I'm only an old electronics tech! I don't have much in the way of physics or chemistry training! I don't know if the solar wind adds matter to a planet's atmosphere. Most of what I have read seems to indicate that there is a net loss, and the Earth is protected by it's magnetic field... if anyone can find anything on that, it would certainly be interesting. I suspect that we are talking about a very small loss, but again that's speculation on my part. For example if Venus were losing 1% of its' atmosphere to solar wind erosion every century, then two thousand years from now it would still have around 80% of todays atmosphere. The loss may be even less than that. Therefore, if it is established that Venus is having its' atmosphere eroded by the solar wind, then that would be consistent with it's present position in the solar system being a recent development. It would not be a stretch to conceive of Venus having an atmosphere a little more massive several millenia ago, after it stabilized into it's present position, it then was subjected to the present rate of erosion. Again, only speculation on my part. Aha, I see where you're coming from now. I was looking at it more from the physics of the actual electrical interaction, being that ESA and the rest of the mainstream only want to look at the upper atmosphere ionic interactions with the solar wind... meanwhile they are completely ignoring the polar storm that EU presumes is being induced by one mighty-whoppin' big Birkeland current feeding into that planet! It may be difficult to measure the magnetic fields, at Venus' surface, until we can figure out how to land craft with magnetometers. They will have to survive the bake oven temperature, for longer than a few hours. Does anyone suppose- or consider it even physically possible, perhaps- that maybe Venus' magnetic field is it's atmosphere? Could it be a very minor, diffuse magnetic field hugging the planet, no greater than the planet's electric field, itself? Could that explain some of the oddities (both meteorological and electrical) that the planet consistently shows us when we examine it? Again, I cite my lack of any professional training in studying planetary characteristics, so please forgive me i any of my musings seem assinine from a scientific perspective! I'd been considering that the Earths atmosphere could be part of it's plasma sheath I hadn't really considered Venus. Venus's lack of a magnetosphere could cause it to be under even more electrical stress and be the reason it has such an extensive atmosphere (compared to the Earth). I still fancy angular momentum and eccentricity as having something to do with magnetospheres but I 'm pretty clueless. Nick said: Since Venus is not protected from the solar wind by a magnetic field, as is the Earth, is the solar wind eroding away Venus's atmosphere? Could anyone furnish some links or otherwise on this subject? * This ESA article at http://www.esa.int/esaMI/Venus_Express/SEM0G373R8F_0.html says (28 November 2007) "Venus Express has exposed the true extent to which the Sun strips away the atmosphere of Venus." Then it says the ions stripped away "are predominantly hydrogen, oxygen and helium ions." And the hydrogen outnumbers oxygen about 2 to 1, as if from water vapor. It doesn't say how much mass is lost over any time period, but the study's authors' emails are given as stas@irf.se, Tielong.Zhang@oeaw.ac.at and Hakan.Svedhem@esa.int, in case you want to ask them directly if they have that info. I think that article or a similar one mentions that some solar wind ions get caught by Venus' atmosphere, but basically only the rare ones, like argon. I read also that Venus' atmosphere isn't disturbed much during solar minimums. * Thornhill has said last April in this article link http://www.holoscience.com/news.php?article=q1q6sz2s that Earth has been gaining mass from Venus via its plasma tail during inferior conjunctions and he says as planets gain or lose mass, their orbits expand or shrink. So this exchange of mass has caused Venus' orbit to get smaller, putting Venus nearer the sun, and with Earth's orbit expanding putting it farther than it used to be. So Earth is still getting small amounts of water from Venus, it seems. But most of its water, along with helium etc, has probably gone to Jupiter and other outer planets and even out of the solar system, since Earth only intercepts a small amount during inferior conjunctions, which occur about five times every eight years, according to http://www.datasync.com/~rsf1/vel/1918ics.htm. * Most of Earth's water came from the plasma column when it collapsed during the planetary orbit instabilities maybe 4500 years ago during the Great Flood, according to Cardona, I think, at http://kronia.com/thoth.html. The Sun has probably been stripping away the Venus’ atmosphere throughout the planet’s four-thousand million-year history. A New View of Venus??? I am an avid follower of the Forum and don't post very often and I am not sure where to start, I don't want to get over excited but I have noticed something about so called "radar images" of Venus and other planets. Frankly I really hope that I am not mistaken but nonetheless i think some of you will be quite intrigued. I am a photographer and designer and came across something that I thought was rather odd while looking at some hi-res images of Venus on the Nasa website. Having spent alot of time at university in the dark room I am very used to seeing images as negatives and while looking at some of the images of Venus i was struck by the fact that these images (which are published everywhere) are in fact negative images. So I did a bit of twiddling around and lo and behold i was completely blown away by what I saw. Electric scarring everywhere, mountain ranges, valleys, craters, ridges etc etc all sitting there waiting for someone to see them. Some of my results are below. Please let me know what you think. Below on the right is an old image of Venus, on the left is the same image taken more recently of the same area. Spot anything unusual? The next image below is the same image with the image on the left inverted. Is it just me or do they look more alike? Here are a few more with the inverted image next to the published images. There are hundreds more. Looking forward to your replies. Re: A New View of Venus??? Hello Wanderer: Good eye! Your method provides a better perspective, i think. I'm a little confused about radar showing shadows cast by the Sun. It would be nice to see a Google Maps terrain view. I'm confused by the satellite images all the time. What looks like a ridge on satellite is a valley, and vice versa. When i switch to terrain the reality jumps out of the screen. Without the terrain feature i wouldn't be spouting all the dune crap. Thanks. I'm with you on the confusion with images, I can't fathom why they publish them as radar images (generally with false colour added) when they are clearly just negatives. Kind of like they don't want us to see whats really there. I particularly like the image of the Mountains and Valleys, looks just like a google view of the Tibetan Plateau. Maybe they publish them as they do because looking at the images in positive would blow their world apart, all the current theories on mountain formation, valleys etc etc would have to be completely revised?? Have read some of your dune work, very interesting.